The goal of the day was to make a calibration curve for the Fluorescence Analysis of Protease Degradation. 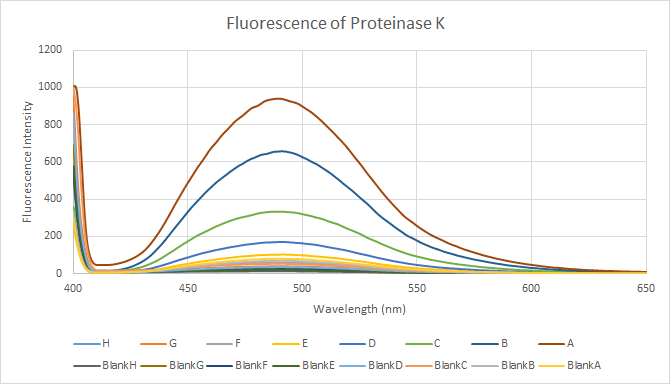 The image below shows the intensity for the fluorescence of samples A though H and blanks A through H from 400 to 650 nm. To create the calibration curve the samples and blanks had the area of their intensity integrated from 420 nm to 650 nm. The equation (Wavelength2 - Wavelength1)/2*0.5 was used and the sums of each interval totaled. The samples were then corrected for by subtracting area of the blank from the total area of the sample. The graph below shows the corrected integrated area from 420 to 650 nm vs concentration of the samples in mg/mL. A linear trend was created, with the line starting at the origin of the graph. The resulting linear trend was y = 688379x or intensity = 688378 * concentration. The R2 value was 0.9702.